NEW A/C!!! 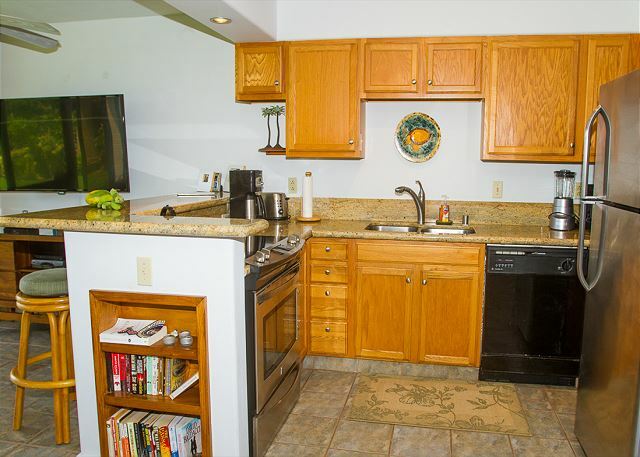 Recently tiled and upgraded, this unit has full kitchen, color TV, private phone with a clean and fresh feel to it. Pay laundry facility on-site. 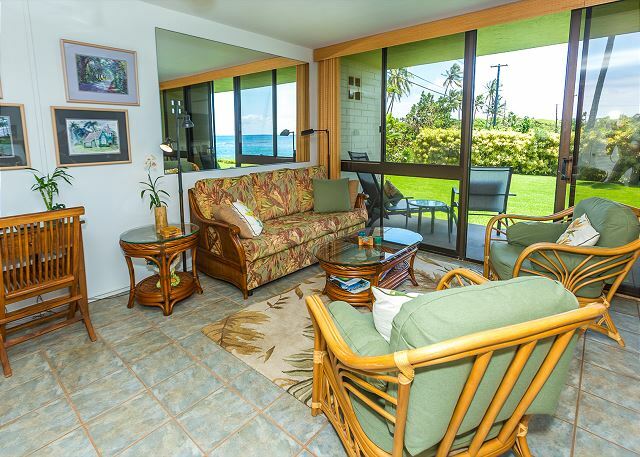 The lanai looks out to a small bay, with views of mountains and open ocean with Turtles and Seasonal Whales. 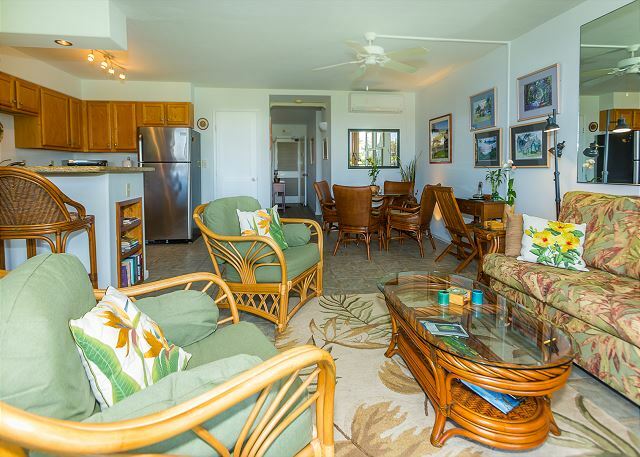 Snorkeling & surfing 20' away, drive to Poipu Beach for safe sandy swimming. Sorry, no pool. Three days before our trip started, we needed to find a new place to stay and found Kuhio 102. Everyone we worked with was exceptional and we got through the process stress-free. Both owner and realty management deserve flying colors!! 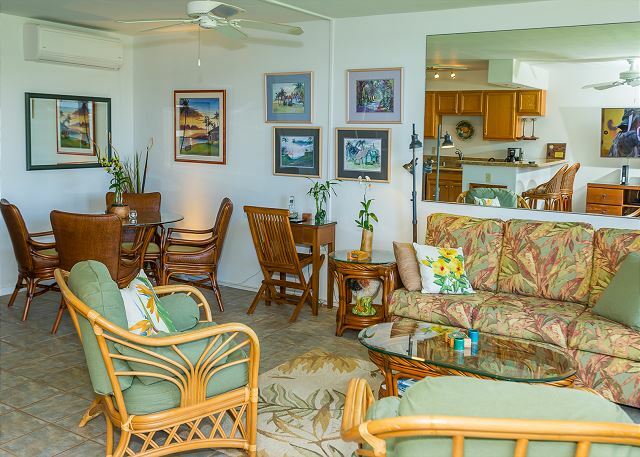 Kuhio Shores felt private and secluded, even though it is near lots of Poipu establishments and activities. 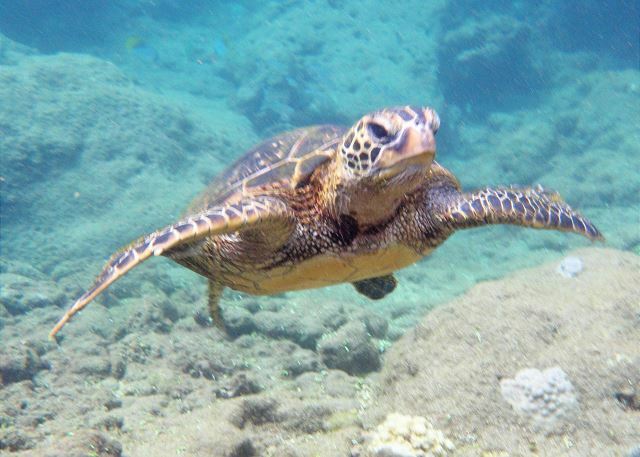 Sea turtles, divers, snorkelers, parakeets, chickens, and whale blows were just some of the sights we had from our lanai. Short walks to farmers' market, beaches, and restaurants provided more activities for us. Our unit was clean and fully equipped. A great place to sit back and enjoy the tropical warmth and color before heading into winter in Washington. Loved being so close to the ocean and hearing the sound of the waves crashing against the rocks. 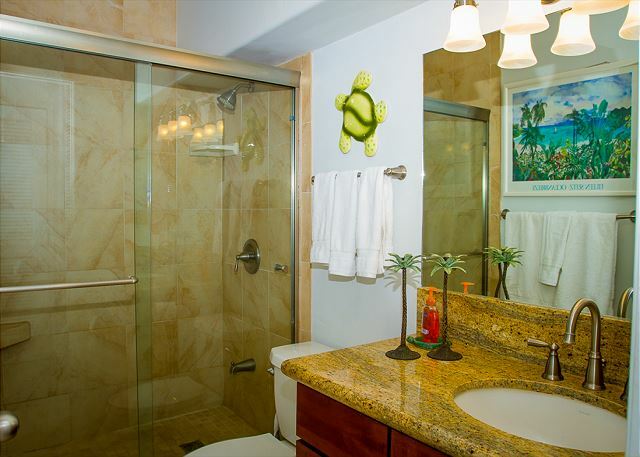 Beautiful sunrises and sunsets, place to walk and enjoy even more of the ocean views and sea turtles. 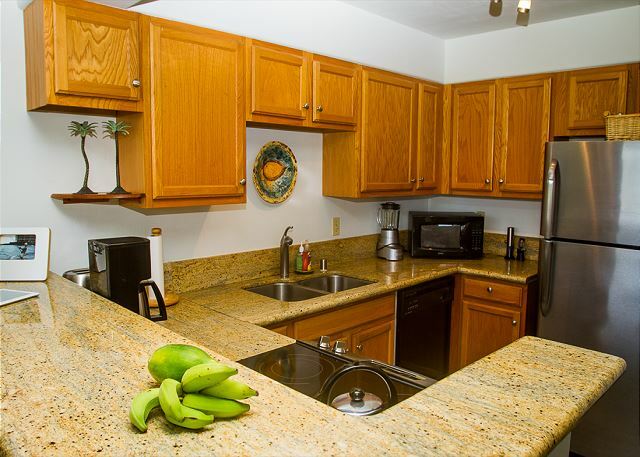 The property is we managed, very clean, and well furnished to meet every need. The bed was extremely comfortable and the A/C made for sleeping in comfort. 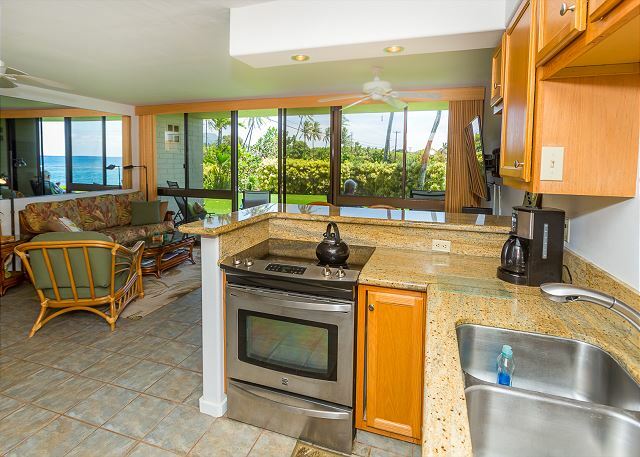 My wife,stepdaughter and I are incredibly happy with our stay at Kuhio Shores #102 . The condo was very clean and had everything we needed for a comfortable stay . The view from the lanai was spectacular and the location was perfect. Our stay was very memorable and will be coming back in the future. The views could not be beat, turtles in the waters edge all of the time! The condo is in a great location, parking was easy and the parking lot smells amazing. Inside is kept cool with ocean breezes, we did not even need the living area air conditioner but were pleased to have the bedroom air conditioner for the extra coolness we prefer when we sleep. We look forward to staying her again. Beautiful location right on the water!! Gorgeous sunrises! Loved the location. Very nice 1 bedroom condo with queen sofa bed. Nice decor, very comfortable, with all the essentials. Especially comfortable king bed & air handlers for cooling it down for sleeping. We really appreciated the beach chairs & cooler, so we could take cold drinks with us while exploring the island. Everything went well - very straight and friendly communication with ownerside, turnover of keys, complimentary late check out. Condo was well equipped. Rental was in good shape, on the water. There were some basics like coffee and spices which helped. There were turtles everyday in the surf. The bed was comfortable. Nice big TV with all the channels. We had a good time. Gaylords Luau was great, much better than Smith River. Snorkeling was good even though I only did it one day due to a cold. Beach House sunset dinner was great. The accommodations and location were perfect. We’re grateful to have been staying in Poipu during the winter months. The mattress was amazing, the kitchen had every tool needed, and having an air condition unit available made us all the more comfortable. We loved the sunrises and swimming with sea turtles in the morning, and enjoyed watching sunsets and surfers in the evening. This was the perfect getaway trip! We loved the condo and location right on the water. Beautiful view of sunrises every morning. The air conditioning was a bonus but mostly we just used the nice overhead fans. The lanai screen door needs to be fixed but otherwise loved the unit.